It is inevitable that you will need to leave your chinchillas unattended while you travel. The ideal is to have someone come to your home and check in on them as well as to replenish food and water. But for short trips, you can do without a babysitter. When you go away for a few days, fill up your chinchilla's food dish with pellets. If the food bowl you use isn't very big, consider adding another full bowl to the cage before you leave. Also, put extra hay cubes in the cage. Put enough in to last while you're away plus a little extra to provide a buffer in case your plans should change. And you'll need to give them their fortified seed mix. They'll eat all of this in one sitting so don't give them more than double the normal amount. Top up the water to a level you think is sufficient given your expected time away. Chinchillas don't drink too much so most water bottles can hold enough to last a short trip. If you keep your chinchillas in a spare room, leave the door open while you're away. This will ensure good air circulation. The exception to this is if you are in a warm climate and need to ensure cool temperatures via a window A/C unit. In closing, it you are thinking about taking your chinchilla with you, please read our post on the issues with traveling with your chinchilla. My chinchilla’s cage is currently in my basement a room away from the washer and dryer. The biggest concern I have would be the noise of your laundry machines. Chinchillas are sensitive to loud and sudden noises so you should keep that in mind(especially during the daytime when they’re trying to sleep). As for the temperature, I like to keep a thermometer in my chin’s room to make sure it’s at a moderate temperature. It’s should be usually at 19-21 Celsius. And if you do decide to adopt a chin, make sure the cage is 4 stories(preferably from “ferret nation”). Goof luck on your situation and hope this helped ! We do not have someone stop by the house while we’re away. The first time we left her she had a little bit of an attitude towards me. I spoke to her as I cleaned her cage, changed the water and gave her a dandelion drop. She was back to her old self the next day. For those who adopt, one question....where do you think these chins come from? Breeders/pet stores? A family I know lets them run all day through their house. They don’t care about their woodwork. Would it be fair to put one in a cage after it’s had all that freedom? If you’ve adopted a chinchilla, they’ve come from families or people who cannot care for them anymore. After you’ve adopted your chin, it makes space for another animal to take their place; while if you got your chin from a pet store, they breed lots of animals after one gets purchased to replace them, causing more animals to suffer throughout the process. As for other question, I think of really depends on whether the chin is used to biting a lot of bad things around the house (cords, paneling, wood, etc..) or if they can manage themselves. I’d personally like to put my chinchilla in a cage for the majority of the day considering the fact that he has no self control and tends to try to eat the drywall when I let him out to play. Hope this helped!
" townhome" from quality cage and have attached lava ledges and a wheel to it. Her hut is also in it. The cage is in a hallway where everyone can talk to her and pet her through the cage. Of course she is taken out and we let her run around in a bathroom. She doesn't mind being held and likes to have her ears and chin rubbed. We leave her every year for about a week while we go on vacation. We make sure she has plenty of essentials and extra chew items. We only give her a dust bath once a week. The children in the neighborhood love coming over and petting/playing with the "bunny" as the preschoolers call her. She loves to run through the cardboard tunnels (that come inside carpets) I hope this helps those who are considering getting a "chin". Hi there ! I was just wondering if you get someone to look after your chinchilla while you’re away. And I suggest that in the future, adopt don’t shop! Thank you so much and I look forward to your response. I am also wondering if you have someone come and take care of your chinchilla when you are away on vacation...to let them out to play, freshen their water, hay & food, or do you just leave her alone all week? Any advice about this would be greatly appreciated as we are leaving for vacation in a couple of days. Thanks you. Hey, I am currently 15 and have a little brother who is 9, we are looking to buy a chinchilla and cannot find one anywhere else but a pet-co and a pet-smart. What are the necessary things required before buying a chinchilla. And if the chinchilla costs 160 dollars what would the total expense be, including the cage dust bowl etc. What should there diet be for a week and are there any special treats that we should give him/her. Also our house temperature goes to 84 at max is there anyway that we could keep them in the basement where it is cooler and with a marble tile or something of that sort. What if we plan to travel for a week and we want to take him/her with us there what would we need to take. How should the cage be setup and what should it contain( like what kind of bedding, what to chew, what kind of foods). Also how many times should it be given a dust bath, and how much dust should be in the bath. Also would it be okay if I made a cage myself out of wood, if not what material should I use. How regularly should i take him/her outside the cage, and when to take her to the vet. Also would it be fine if i took her to the vets that are there at the store. can we let it roam around in the grass or on the deck, also if we were to say be unable to handle it where would i take it too to give it off. And if you guys think there is a better option for a pet that is small cute cuddly and not to expensive please let us know. Hi, please dont buy any animals from petsmart or petco because they breed tons of animals in bad conditions and people buying them are only making matters worse. Please look into adoptiong ! thank you! Going on vacation with my family for 5 days how often should my friend check on my chinchilla? I really want to get a chin, but I hear they live an extremely vast lifespan and I am 10. Therefore it will most likely live to see me go off to college and possibly even grad school, and I won't quite know what to do with it. My parents don't really want to take care of it when I move away to achieve my dreams at university, as it will be my pet and I am responsible for taking endearing and appropriate care for this delicate animal. Although I may have the ability to take proper care of this pet in a dorm, it would trouble me to have my chin be deprived of space to freely run across a vast outdoor area (fenced in from my dwarf hotox rabbit), as i would need to purchase a running chin ball and he wouldn't have an outdoor are. Therefore I need to know if I can find a good home somewhere or somehow for an adult, trained chinchilla or if I should wait to purchase one after settling in from grad school. My only concern about that scenario is that I have $800 now that I raised, and I may not at that point, but I will have enough to pay for a payment of ~$60 per 3-month period. Also I will have to wait 14(plus or minus a few years) years. What if my parents are divorced and I can take it back and forth but my dad won't take care of it because it is not his. hi, i am thinking about getting a chinchilla but i'm worried that when i go off on a holiday or if i go travelling for a few months it is going to be hard to get someone to look after them. Also very expensive. I'm sure that if i do get chinchillas that my friend could look after them and i could check in but if you can think of any other possibilites? Also is it better to let them run around the house than in a cage? You can let them run around in a enclosed room in your house for a 1-2 hours each night. But if you let it roam around your whole house then it'll just bite everything. There are probably many possible causes of your chinchilla's death. If you got her from a pet store that would explain why she died. Pet stores are cruel to the animals and the animals often are sick. You should also give the chinchilla some time to settle in next time. If you want this time to be a success do your research! Make sure your daughter knows how to properly handle the chinchilla too. You could also consider buying two chinchillas as long as you know how to introduce them properly. It is very important that you know what you are buying is not a cuddly creature that likes to be held and hugged all the time. 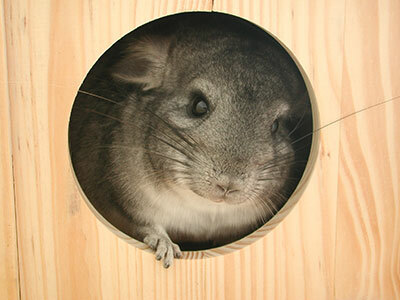 Just make sure if you adopt another chinchilla that you get it from a breeder and research everything you can about chinchillas. Hope if you decide to get another one it works out! I have a question about hay cubes. Can chinchillas be fed regular hay, like alfalfa, and/or fresh grasses? And in what quantities? Thank-you very much. They can. I have been giving my chinchillas loose alfalfa since i got him when i was in grade two (currently 12). Of course you can! its all mine eat, and as far as how much you just want to make sure they have some. Don't add to much at one time, other wise it might spoil and then they wont eat it. Hello, hey does anyone know what to do if you have a chinchilla and you are going on vacation for about 3 or 5 days and you have to leave him/her home? Because i'm thinking of getting one same as what Leah said! For Christmas vacation, I will need to be away for almost a month. Although I'd like to board my chinchilla with a vet, it seems very expensive, and I am doubtful that they will do much more than a friend would do. It seems like a large burden to ask my friend to let my chinchilla out to run; if I just have them make sure the chinchilla has plenty of food, water, dust baths, and some attention, will she be ok without running around all the time? She has a wheel to keep her occupied. Even if I did board her with a vet, are the vets likely to let her run around? take her to a friends house. that way your friend will not have to go back and forth. What about dust baths? Like do you have to make sure that someone comes over to do it for you while you are away? And by the way, this is a great website. I'm thinking about getting a pet chinchilla and I'm finding basically everything I need to know here. It's really cool how it's centered around your guys' chinchilla experiences. It makes it easier to trust. Thank you! the only thing you have to worry about is if they pee in there. thenyou can't reuse the dust. if they poop you just have to scoop it out. when the dust gets clumpy you have to through it out. Leah, Chinchillas need their dust baths, but you will need someone to come into your house daily to let your chinchilla into it. see, this is because if you leave the dustbath inside your chinchilla's cage, they will use it too often and then their fur will dry out. chinchillas should have dust baths every other week, depending on how much you hold them. If you hold them a lot then you might want to give them a bath more often. and remember chinchillas cant get wet so no water bathes!!!!!!!! Chinchillas will chew on electrical cables. They'll actually chew on just about anything. One question about leaving them alone. Is it true that they like chew on electrical cables ? Do I have to hide all the cables ? yes they will chew on just about anything but,as long as there in a cage with no wires in their reach you should be fine. There's no way to know if your remaining chinchilla will be happy. You'll need to compare the behavior of your chinchilla before and after. As for the dog or cat playing with a chinchilla, we strongly advise against. Even if the dog or cat is friendly, a misplaced swat of the paw or chomp of the teeth could really harm (maybe kill) your chinchilla. This is not about traveling. We had two chinchillas and one ran away. Will the one we still have be happy even though it doesn't really have anyone to play around with? We are also thinking of buying a cat or dog that likes to play with chinchillas. Is that okay? In theory you could leave your chinchilla in its cage with enough supplies for a week. However, chinchillas get very used to routine and can become quite stressed when their routine is changed. We try to have someone stop by when we're on vacation. Also, make sure you have a wheel to give them an alternative to running outside of their cage. If you leave on vacation for a week but give them enough stuff and make sure the airs good and everything you said above, will it put stress on the chinchilla cause no one is home and it can't go out of its cage? My family does a lot of traveling. Will that hurt my chinchilla in any way? Chinchillas don't make good travelers. They are pretty skittish to begin with so the constant change in environment will stress them greatly. Plus, they are prone to overheating in temperatures that you might find bearable. We don't recommend taking your chinchilla on your travels. However, if you're moving or something and need to take your chinchillas with you, you can use any well ventilated pet carrier. Be sure to include food, water, and a place to hide. Be sure to also not put anything in it that might harm your chinchilla if the carrier gets bumped. What if you wanted to bring your chinchilla with you when you go traveling? Will it stress them? And what should they travel in?